Copyright © John Madden 2016. All Rights Reserved. 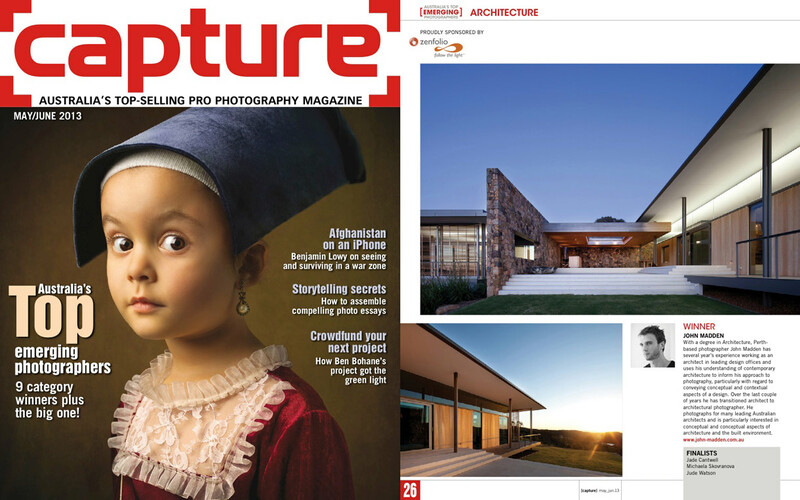 Following up last year’s result, I am pleased to announce that I have won the architecture category of Capture Magazine’s ‘Australia’s Top Emerging Photographers’ competition. The jury for the competition is made up of leading architectural photographers, including two of the most respected and prolific in Australia, John Gollings and Tim Griffith. The series of photos submitted for the competition included commissioned work by Pendal & Neille, Tierra Design and Donaldson + Warn. Congratulations to runner-up Zoe Wetherall, and all of the other finalists. Details can be found in the May/June 2013 issue of Capture Magazine.